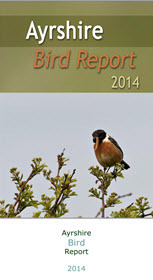 The printed copy of the 2014 Ayrshire Bird Report is now available. It consists of 102 pages including 18 full-colour inner pages with 36 photographs. It can be obtained via the outlets listed here. This entry was posted in News on 22-Sep-2017 .